In this video we will discuss about merging cells in the gridview footer row. Let us understand this with an example. 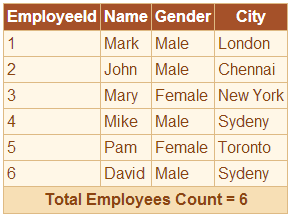 We want to display total employee count in gridview footer row as shown below. Notice that, all the cells in the footer row are merged. Step 4: Generate gridview, RowDataBound event handler method.